Albert Einstein defined insanity as doing the same thing over and over again and expecting different results. So, don’t fear, shredding paper isn’t insane because you will always get the same result-a box of paper scraps! But, it can feel like an insane task when you get daily magazines and papers in the mail that have personal information on them and you can’t just toss them; you really need to prevent identity theft. So, do you want an alternative to a date night with your shredder? You could have a nice bonfire or use those papers to start a fire in your fireplace. You could keep a box that contains all the documents that need to be shred and take them to a local office supply store like Staples or Office Depot so they can shred your papers. Does that seem like too much work? Why not securely stamp out the information on your papers or magazines so you can discard them instantly? Some people aren’t aware, but there are many security/identity theft rubber stamps on the market. 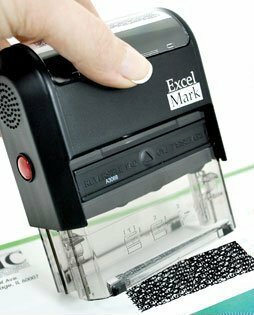 With a quick stamp, any personal information is covered over with a special pattern so that the information underneath is rendered unreadable. Think this is a nifty gadget? Have you used a similar stamp before? Or, perhaps you want to share a story about a shredding nightmare? Go for it! We’d love to read all about it on our blog page and so would our readers. Spread the insanity! Just click the review button below and post away!